Syed Arshad Husain, M. D., is a child psychiatrist known worldwide for his work with children living in war zones and disaster areas. 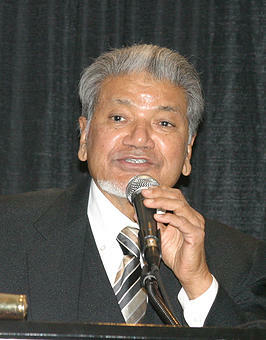 Dr. Husain founded the International Center for Psychosocial Trauma at the University of Missouri, and counseling centers in Bosnia, Kosovo, and an Afghan refugee camp in Pakistan. He has published scientific articles in major peer-reviewed journals in the U.S. and Canada, and has written five books including Hope for the Children: Lessons from Bosnia. He has received numerous awards from major professional societies including the American Medical Association, the American Psychiatric Association, and the American Academy of Child and Adolescent Psychiatry; 2014 awards include the National Council for Behavioral Health Doc of the Year and the American Academy of Child and Adolescent Psychiatry Catcher in the Rye award. He was given an Honorary Ph.D. by the University of Tuzla, Bosnia. Currently, he is Professor Emeritus of Psychiatry and Child Health at the University of Missouri–Columbia and serves as a medical director of a large behavioral health organization in Missouri. In 2015, he received the coveted Citation of Merit Award from the Missouri University School of Medicine Alumni Association. His MSI book, co-authored with A. Darius Husain, Roadmap to Power, was released in Fall 2015 and has been recommended by the US Review of Books.